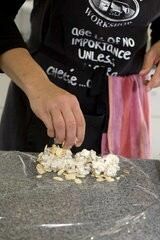 This Cheesemaking workshop is something I have been interested in trying for a while. Each time I see a recipe which includes Paneer, Ricotta or Yoghurt in the ingredients it goes through my head that I would like to (at some point) have a go at making these items myself, from scratch. Even though the recipes I have, seem straight forward, I am sure there are a few tricks which would be the difference between success and failure. 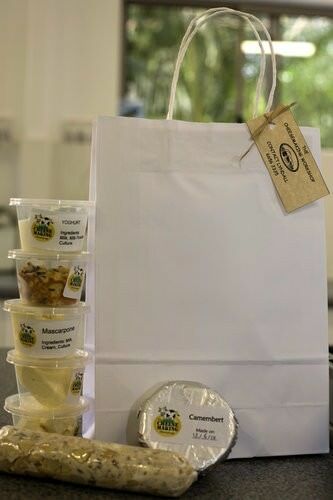 As luck would have it my mother mentioned that we have a local cheese making workshop which runs courses on making Camembert, Feta, Quarg/Cream Cheese, Mascarpone, Ricotta Cheese and Yoghurt. 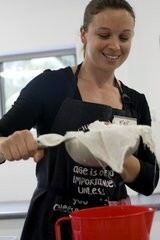 I can’t imagine the process involved in making Camembert but I am excited about giving it a go so mum and I have booked in for a class together. When I arrived I was greeted by Lyndall the owner of the school and shown through to the purpose built commercial kitchen and my cheese instructor for the day Kelly. 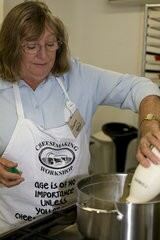 Once we all donned our “cheesemaking aprons” (very cute) it was on to our first cheese for the day. Camembert has a few more steps than the other cheeses we will be making so we started with warming the milk for this cheese. In the meantime, we were directed to a sample plate of lovely homemade cheeses to try. They were so creamy and delicious, the camembert was lovely and strong which I don’t seem to find lately, so I was very appreciative of this one. 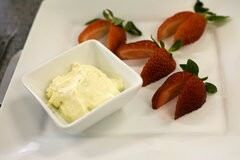 We were also presented with a beautiful plate of Strawberries and Vanilla Bean Mascarpone which was absolutely amazing. We tore ourselves away from the platters and listened to Kelly explaining about the cheese culture starters, the rennet and white mould for the camembert. 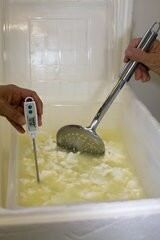 We then heated milk for the feta cheese and set about using the appropriate starter for this cheese. With Kelly’s help and the recipe we had soon set up the feta cheese tray with cultures and it was time to put a lid on that one too and leave it to do its thing. 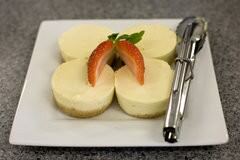 Morning Tea suddenly appeared some lovely baked cheesecake made from the kitchens own mascarpone and quark. We made ourselves a cup of tea and headed to the deck to ponder the view and eat a very decadent morning tea. The cheesecake was creamy, lemony and absolutely delicious. I have been promised the recipe so I will be sure to give it a go at home. My poor Mr GG has missed out on all the yummies today so I will have to make it up to him. Back to work and it is time to prepare the ricotta cheese which we will be using in the Spinach and Ricotta Cannelloni we will be having for lunch. We prepare the litre of milk by heating it to 90 degrees and then adding 50mls of vinegar and taking it off the heat. The curds and whey immediately separate. 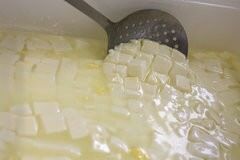 We are told this mix should sit so the curds form a raft on the whey so we leave the ricotta temporarily. This seems like a good opportunity to have another cheese sampling. 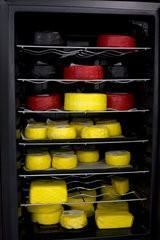 We are shown the fridge which houses the hard cheeses made in the advanced cheesemaking workshop. It is like a treasure chest of coloured waxes holding various varieties of cheese. 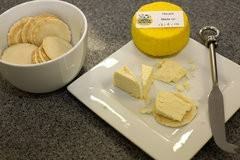 We try a Havarti cheese which is absolutely beautiful. I possibly should have photographed it before it was devoured but it was too good to resist. We went back to our Camembert and Kelly showed us how to cut the cheese which we in turn did. 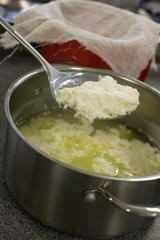 The Ricotta was ready to drain so we were shown how to line a strainer and drain the whey from the Ricotta. It was so simple that I am embarrassed that I have not attempted to make it sooner. The Ricotta was left to drain for a ½ hour while we returned to our feta and camembert. We proceeded to turn the cheeses under Kelly’s instruction. There are a lot of processes to making these cheeses but once they are explained and demonstrated we were confident to try it ourselves. 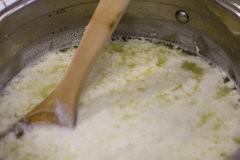 We then returned to preparing lunch with the newly made fresh ricotta. Mum got the job of filling the pasta sheets with the ricotta and spinach which she did beautifully. Mascarpone was then dolloped on the pasta sauce and the dish was topped with more cheese and put into the oven. A cheese and herb pull apart, which was being prepared when we arrived, was also put into the oven and I was wishing I had worn my stretchy pants. Kelly showed us how to make a quick Baked Ricotta with the leftover ricotta mixture and we returned to the Camembert curd to turn it a few more times. The next job was to cut the Feta, this is the same process as the camembert only the cuts are smaller as it is a dryer cheese. We had the most amazing leisurely lunch chatting and enjoying the local produce. 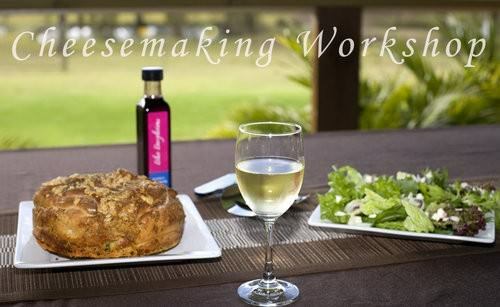 The cooking school is very community minded, I noticed the local vinaigrette from “Berrydelicious” was used on the salad and the wine was a lovely white from “Two Tails,” a vineyard at Nana Glen just West of Coffs Harbour. I hadn’t tried their wines before but I will be having a closer look as I really enjoyed the crisp clean taste. I asked if any of the cheeses were sold commercially as there seemed to be a huge quantity in the fridges. Kelly said they weren’t. I couldn’t help ask what happened to all the leftover cheeses. She said there really isn’t too much left over from classes and when there is, the neighbours are generously given a goodie bag. I guess based on all the cheese we tried, lunch and our sample bags I can understand how much cheese is consumed in the classes. After lunch, we were shown how to make yoghurt and a cheese starter culture. Using a previously prepared mix (it needs to stand for 24 hours) we then made mascarpone and Quark. Both were as simple as the Ricotta draining process and I felt totally confident to try them at home. The next item on the agenda was the tricky step, cooking the Camembert. This is a heat critical step which helps the camembert to set as it ages inside the white mould. Each step is making more sense to me as we go through the processes and I am excited about giving it a go at home. We then drain the whey and start filling our containers with our own little Camembert. We do the same again with the Feta and we are now confident cheesemakers. 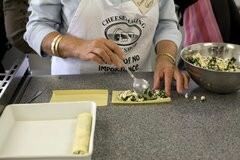 The last little recipe we made is a rolled soft cheese. It is a Rum & Raisin Log with toasted Almonds on the outside. It was a very simple recipe with quark, rum and raisin rolled in the flaked almonds but absolutely delicious and gave us another idea of how to use our quark and a nice way to complete the day. It has been a very full, indulgent day, and so much more than just a cheese making workshop. We have sampled so many gorgeous homemade cheeses, eaten a delicious relaxing cheese inspired lunch with a glass of wine, cooked with lovely people and had a great day learning a new skill. I have collected a few more recipes. We have been absolutely spoilt with local, homemade produce and I have had a thoroughly enjoyable day cooking with my mother. I have collected a few more recipes. We have been absolutely spoilt with local, homemade produce and I have had a thoroughly enjoyable day cooking with my mother. The cost of the day is $150 which includes lunch and a take-home cheese sample pack. To put my new cheese making skills to the test I will be making a Camembert first so check in and see how I go. It will be four weeks until my Camembert is ready to eat but I will take progress shots along the way and hopefully I will be able to grow that beautiful white mould and have a lovely creamy centre.